Though Visual Studio started as an IDE for building applications based on Microsoft Technologies, lately the IDE is expanding its domain by adding capabilities to build apps based on other technologies too, including many open source technologies. Projects like Node.js Tools for Visual Studio (NTVS) and Python Tools for Visual Studio (PTVS) prove the openness the IDE is adopting these days. In this article, we will see how these tools can be used to build modern web apps on Visual Studio. This articles uses Visual Studio 2013 and the latest Preview/CTP5 version of Visual Studio 2015. If you are a user of Visual Studio for a long time, you would be using Web Essentials too. Web Essentials is an extension from Microsoft created by Mads Kristensen, that adds a lot of features to make web development better on Visual Studio. In Visual Studio 2015, Web Essentials adds the features of adding Grunt and Gulp to Visual Studio. 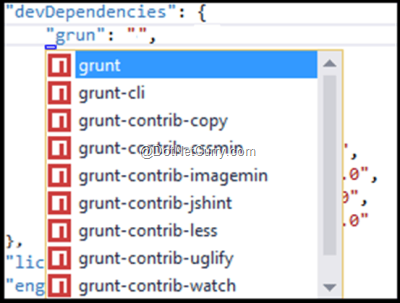 For VS 2013, we have a plugin called Grunt Launcher, written by a community member to add tooling support for Grunt and Gulp. Before you move forward, make sure that you have these extensions installed. They can be installed either directly from Visual Studio menu (Tools > Extensions and Updates), or by downloading the vsix files from Visual Studio Extensions Gallery. You need to restart Visual Studio in order to get these extensions working. Note: To use Grunt and Gulp in VS 2015 Preview/CTP and in VS 2013, you need to have them installed globally. Final release of VS 2015 will use the packages installed in the project and won’t need the global packages. Now that you got some idea on the tools to be used, let’s use them in an application. If you want to follow along this article, download the sample code of this article and open the MovieList – 2013 or, MovieList – 2015 on either VS 2013 or VS 2015 respectively. These folders contain all of the required code, but don’t have NPM packages, Bower packages and Grunt or Gulp added to them. VS 2013 project is created from an empty ASP.NET template and the VS 2015 project is created using ASP.NET MVC 5 starter template. The reason for choosing two different templates is to show that Grunt and Gulp can be used with any kind of application. Both these projects contain Entity Framework code first classes and ASP.NET Web API or MVC 6 controllers to serve data. 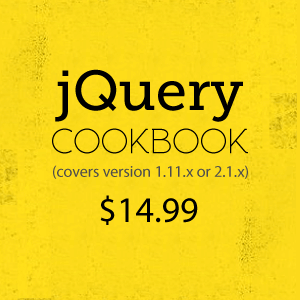 On the front-end, they have just one view built using Bootstrap and Angular. This view fetches data from the API and binds it to the view. You won’t be able to run the application unless you have the required scripts and styles at their target places. Once you open the project inside Visual Studio, check the files and folders to get familiar with the code and the way it is organized. The project was created using ASP.NET Empty project template and then I added some other files to it. As you see, the project doesn’t have any existing Node and bower dependencies. Let’s add them now. 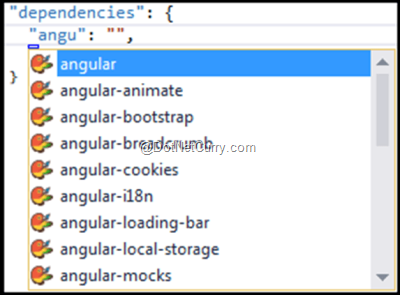 Even in this file, you will get intellisense when you type-in the dependencies. Here we are loading all available grunt tasks and storing the contents of the package.json file in an object for further use. This task will copy the libraries into the folder libs under public folder. 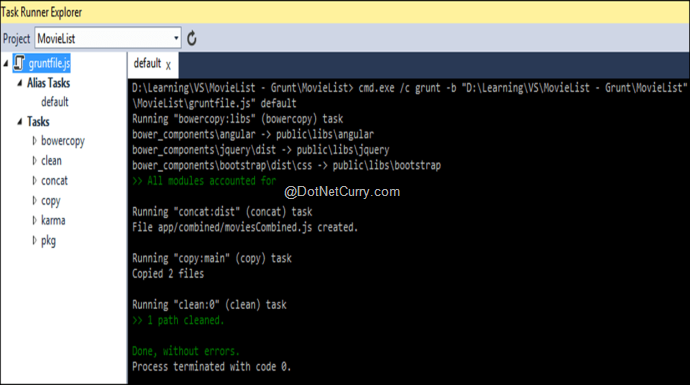 Let’s concatenate the files using the Grunt task grunt-contrib-concat. Following is the Grunt configuration for this task, it concatenates the three files and stores the resultant file in another folder. The option flatten: true is used to avoid creation of folder structure under the target folder. Here, default is the alias task that runs a number of other tasks internally. Now we are done with configuring the tasks. Let’s run the tasks and see how it behaves. To run the task, open Task Explorer in Visual Studio through View > Other Windows > Task Explorer. Now run the application using F5 or Ctrl+F5. You will be able to see the page loading in the browser. Gulp is an alternative to Grunt. It uses a different approach to solve the same problem. As already mentioned, Gulp uses node streams. Each task in Gulp produces a stream that can be piped into another task to continue execution. This approach is comparatively efficient than the approach used by Grunt, as it doesn’t need to store results physically to make it available to the next task. Also, being programmers we prefer calling functions over writing configuration objects. In Gulp, we write chained function calls (as we do in LINQ). 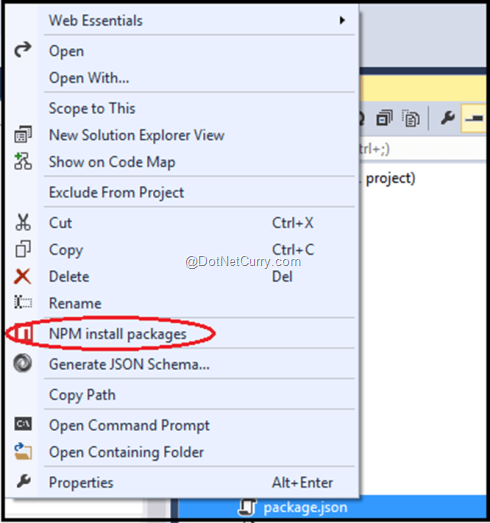 Install these packages using the Visual Studio context menu options discussed in the previous section. As you see, this setup is quite different from the setup we did in grunt. It is also a bit tricky to think in the terms of Gulp if you are used to Grunt for a long time. In the above snippet, gulp.src is a task and its result is passed to gulp.dest using pipe. As mentioned earlier, Gulp works on streams. gulp.src produces a stream and this stream is used by gulp.dest. The second parameter in the above snippet is a list of tasks that have to run before this task runs. So whenever we run the copyLibs task, it internally runs the bower task. The only independent task left is copying CSS file to the dist folder. This task is straight forward. As you saw, Visual Studio has first class support for working with the front-end task runners. If you have kept yourself away from these tools till now, now is the time to start using them to get your job done and have an experience with the tools that everyone else is using. You will love it! HiRavi, thanks for your article. I tried to download the sample code but its not available. @ng-martin sorry about that. We fixed it. Try the sample again. What about during a TFS build. Do i need to run grunt with node to achieve the same? Trent, Yes. You should have Node installed on the build server and your deployment process should have grunt scheduled in it.